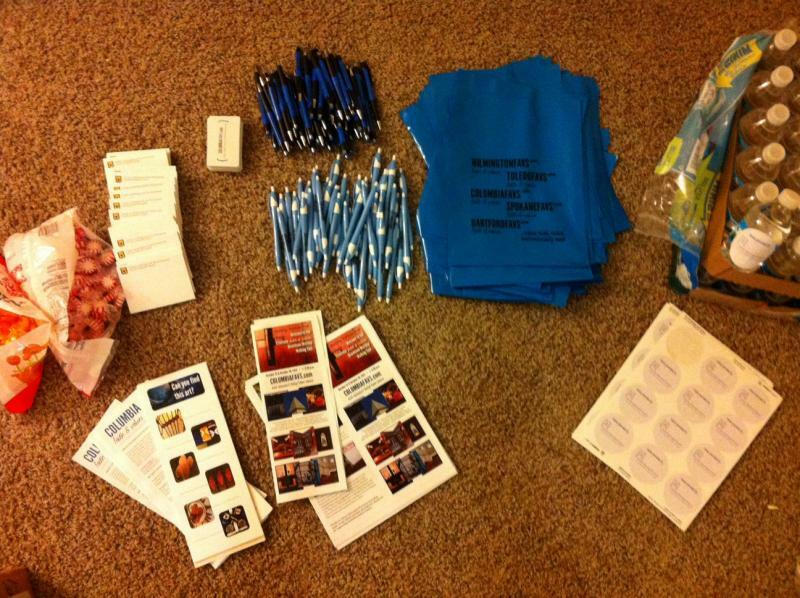 Tour materials lay scattered on ColumbiaFAVS editor Kellie Kotraba's floor in preparation for a walking tour of downtown houses of worship. The Columbia Faith & Values Downtown Worship Walking Tour will start at 1 p.m. on Oct. 19 at First Christian Church, at the corner of Tenth and Walnut streets. I’m the editor of the nonprofit religion news website Columbia Faith & Values (ColumbiaFAVS.com). In that role, I edit stories, recruit writers from around the community, work with student journalists, do my own reporting, and yes, do marketing and fundraising. That’s where the tour comes in. Last spring, I led a walking tour of five of Columbia’s downtown churches. With about 30 people making $10 donations for admission, it was a success. Columbia Faith & Values, which is currently funded by a grant from the Lilly Endowment, had $300 to apply toward sustaining ourselves in the future. I planned another tour for this fall. But this time, I included more venues and scheduled two weekends, so more would people have the opportunity to come. One was last weekend, and the other is coming up this Saturday. As I finish preparing for this weekend, I want to share with you some of the things I’ve learned from doing these tours. 1. People are extremely generous. People have not only opened up their buildings, but their schedules, their kitchens and their wallets. Secretaries and clergy have helped with coordination; volunteers have offered to give a talk at each tour stop. One place provides refreshments for a time of fellowship at the end, while another provides water for the walk. People who come make a donation to support the website. Everyone gives generously, with a welcome smile and no hesitation. 2. Fun facts help you relate to your community. 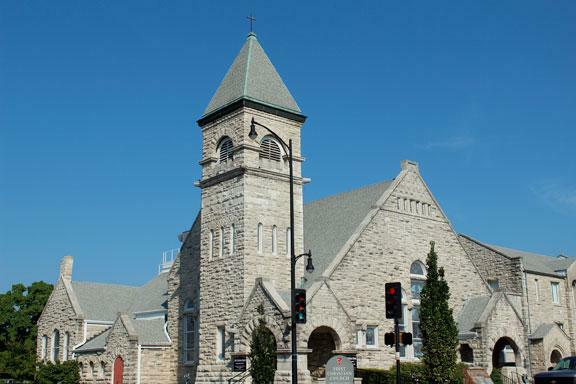 Did you know First Presbyterian Church has the second-oldest bell in Boone County? Or that the kneelers in Calvary Episcopal Church have been needlepointed by? Or that there’s a mistake in some of the stained glass at Missouri United Methodist Church, but it was kept to add character (and because it’s a good story)? I didn’t, either – until I started researching and asking questions. On the surface, it’s fun to know random tidbits of information. On a deeper level, knowing the history of these buildings we walk past every day enriches us, and allows us to better understand and appreciate our surroundings. 3. It takes a community to promote a project. You've heard the saying "It takes a village to raise a child"? One of the greatest lessons I’ve learned from this is that doing an innovative project like this website requires – demands – community support. Here's an example: Earlier, I mentioned that I led a successful tour this spring, and I had another scheduled for last Saturday. But last Saturday, nobody came. The goodie bags were stuffed, the venues were ready – one even made treats – and I was wearing a new outfit. But at 1 p.m., the foyer of First Christian Church was empty, save me, a volunteer from the church and my two assistants. Of course, Columbia Faith & Values was competing with a Mizzou game and the Hartsburg Pumpkin Festival. Still, I had assumed that if people had come the first time, and if I promoted it, the tour would draw a crowd again. But one person’s efforts — and even one site’s efforts — aren’t enough. In the days since that 0-turnout tour, people have stepped up to help spread the word. My RSVP list for this Saturday is growing, and I’m seeing publicity for the tour that I didn’t post. This was a humbling learning experience for me, but also a wake-up call for others who support Columbia Faith & Values: Our own love and support won’t make the tour a success and the site grow. We have to reach out, to work even harder together, to make a difference. If you’re interested in attending the Columbia Faith & Values Downtown Worship Walking Tour, I hope you’ll join me from 1-3 p.m. Saturday. The tour starts at First Christian Church, and the doors will open at 12:45. To make a reservation, call me at 573-356-2200, or email me at Kellie.Kotraba@ReligionNews.com. The suggested donation is $10, and all proceeds go toward Columbia Faith & Values – and ultimately, toward providing a space for healthy, diverse faith news, education and dialogue.